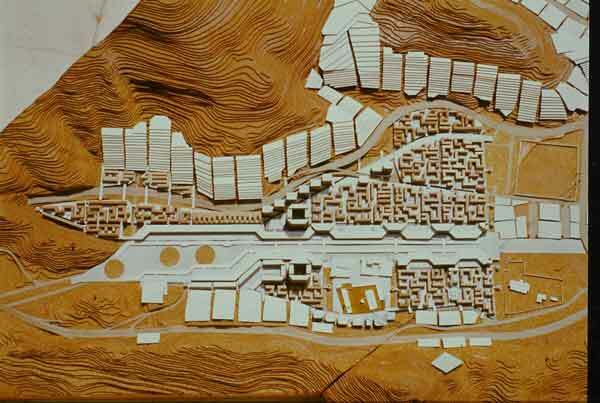 Urban design project for the town of Mina, outside Mecca, and an important part of the Hadj pilgrimage route with runs from Arafat to Mecca.. The three circles are the site of the Jamarats, stone pillars symbolising the devil. Pilgrims are required to throw stones at each of the pillars. This has been the scene of several unfortunate crowd panics and subsequent deaths. The aim of the project, commissioned by the Saudi Government, was to create an an organised route and arena for the ritual. 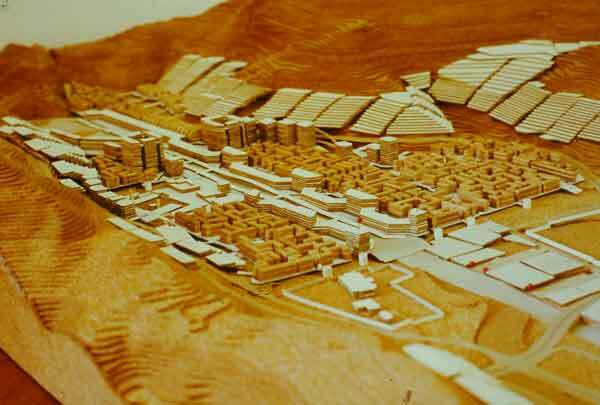 At the same time, the town of Mina was to be rebuilt to provide accommodation for 500,000 pilgrims en route. Further accommodation for a further 1.5m people was to be provided by enlargement and reorganisation of the existing camping area adjoining the town. The project included building an organised pathway system and facilities buildings for that area.